Technical support / M.P.E. Co., Ltd. Regular maintenance is required in order to use a mechanical parking system comfortably (You need separate maintenance contracts). Checking and refueling each part is done in regular maintenance. 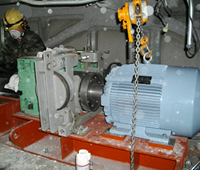 Also aged deterioration parts are replaced, abrasion state by the machine movement is confirmed and reported. When urgent troubles such as not working of the parking system occur, we will instruct and response with contacting maintenance contractors. Diagnosis via internet is possible, we therefore deal with troubles in remote places. Renewing the part which could not be dealt in regular maintenance, remodeling car rooms for high roof vehicles, replacing of motors and chains, adding new function(Internet communication system etc), these are done as renewal construction. Since the structure of machines is simple and few special parts are used, renewal construction can be quickly implemented and relatively inexpensive.